I’m standing in for Ethan Zuckerman, blogging from TED today. This post is part of a series from the TED 2009 conference held in Long Beach, California from February 4-8th. You can read other posts in the series here, and the TED site will release video from the talk in the coming weeks or months. Because I’m putting these posts together very quickly, I will get things wrong, will misspell names and bungle details. Please feel free to use the comments thread on this post to offer corrections. You may also want to follow the conference via Twitter or through other blogs tagged as TED2009 on Technorati. Louise Fresco is a powerful thinker and globe-trotting advisor on sustainability, Louise Fresco says it’s time to think of food as a topic of social and economic importance on par with oil — that responsible agriculture and food consumption are crucial to world stability. 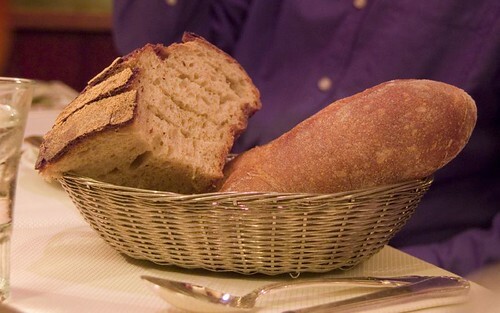 Bread is a standard diet for people all over the world, not just in the West. She shows Wonder bread and the whole wheat bread and asks which one people like more. It’s overwhelmingly for the whole wheat, home made bread. The industrial revolution brought us many great advances. But it also created a world of supermarkets. We shouldn’t despise the Wonder bread, because it means that we have created a way to make bread available to all. Even though it is tasteless and has a lot of problems, it has changed the world. Bread is now associated with obesity, because we’ve begun to add more and more high calorie ingredients to it. The price of mass production has been the destruction of many of our landscapes, and the costs have been tremendous with regard to the habitats. How many of you can actually tell wheat apart from other cereals? Do you know how much a loaf of bread actually costs? The counter movement is to go back to small scale, farmers markets and home made bread (much of that started in California). This is a fallacy, of us romanticizing the past. This is a luxury solution for us. We will be relegating the other agriculturalists around the world to poverty. It puts local food production out of business, and puts the urban poor out of food. We need more science, and good science, to better understand the technology around pest and disease resistance. We need to think about urban food systems and to combine agriculture and energy. Most importantly, we need a food policy, not just an agricultural policy.